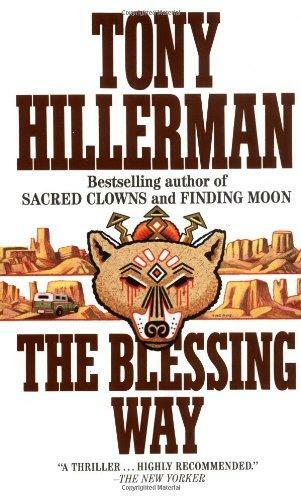 This is special Forgotten Book week on first novels, and I decided to re-read and post on Hillerman’s first novel, The Blessing Way, which is also the first novel featuring Navajo policeman Joe Leaphorn. When I was about halfway through the book, Bob Byrne posted an excellent article over at the Black Gate site on the The Blessing Way and he has gone into a lot of detail about the writing of the book, the revisions it went through and the nature of the plot. It’s very good and I think you should click (here) and go read it. The following week he continued with more on Hillerman and the second book in the series (here). Then hop on back and I’ll tell you briefly what I thought of the book. Back? Great posts, right? Okay now for my opinion. Like Bob, I had forgotten how much the book is McKee’s as much as Leaphorn’s. Memory plays tricks, and I kept expecting Leaphorn to emerge into the plot. This is a fine mystery, and Leaphorn is in it, but it’s clear Tony Hillerman was feeling his way, writing a mystery with “Indian stuff” but not completely settled on his main character. Still, it’s a damn fine first novel, and it sets the stage for the series that follows. Perhaps a new reader to the series is better served to begin with Dance Hall of the Dead and return the The Blessing Way after. Either way, these are very good books, filled with strong character and steeped in the southwest location. Highly Recommended. Well, I am very glad I read this. I do have The Blessing Way, but I will skip that and start with Dance Hall of the Dead, and then come back. Thanks, Richard. My pleasure, Tracy. I hope you like the book. I really should get back into these books – its been decades since I read one – hate it when I realise that! Time does slip by, doesn’t it? I really enjoyed revisiting Hillerman. I enjoyed the early books in this series. BLACK GATE has become one of my favorite web sites, too. Their coverage of mysteries is surprising. Me too, George, and with SF SIGNAL now shut down, it’s even more essential. Many years ago when Hillerman was starting out, I did read DANCE HALL OF THE DEAD first. I’m not sure I ever went back and read THE BLESSING WAY. It’s a good book, Bill, worth your time. I also read DANCE HALL OF THE DEAD FIRST, in October of 1974, followed a month later by THE BLESSING WAY and THE FLY ON THE WALL. For whatever reason (I certainly can’t remember why now) I never read another until May of 1993, when I did a big catch-up on all the ones I’d missed (8 in the next 5 weeks), and kept current after that. Great series, though I think I like Jim Chee more than you do. Seems so. Have you read the continuation books by his daughter? I have. I spoke to her about them at Bouchercon in Raleigh. I think she’s done a pretty good job, though she still has something of a problem with endings. But then, her father had that problem occasionally too. I devoured the entire Leaphorn/Chee series in about three months right after I read The Thief of Time which I bought out of curiosity from the Paperback Book Club when I was a member. DOes that still exist? I had never read anything about Native Americans until then and this helped arouse in me a desire to visit that part of the country as soon as I could. Excellent books! I especially like those that deal directly with the Native American myths and legends and those that incorporate shamanism. My favorites are SKINWALKERS, PEOPLE OF DARKNESS (a rather sad book that one), and DANCE HALL OF THE DEAD which I think is the book that taught me all about peyote (among many other things!). These books strike a chord with many readers, John, and I agree with you on those books you name. I read everything Hillerman wrote, including his autobiography, in which his modest, unassuming good nature comes thru in a plain-talking, self-effacing style. I have yet to try any of his daughter’s. Not sure why, altho maybe I’m afraid to be disappointed. I think that’s the reason I haven’t tried them, Matt.